UNCOMFORTABLE MOMENTS: Imported Foods I'm Enjoying. Not sure if you've heard much about it, but it's been snowing a lot in D.C. lately. In December we had Snowpocalypse, just last week we had Snowmageddon, and right now we are having Snowverkill or Snowverit. These are the accepted media monikers for the storms, I think, though I would prefer to lump them all together under Snowpocalypse, or perhaps SNOMG or Snowgasm, the latter two terms I saw written into the snow on parked cars over the weekend. Though complaining is my forte, you will not hear me complain about the snow. I freaking love it. It's true that several factors allow me to love it (no driveway to shovel, no kids to entertain or bundle, a building with good heat, a spot in the city where I can walk to a grocery or the drugstore, no loss of power, a snowless stint in SF that made me appreciate it all the more), but in general I'm disposed to love it regardless. It's beautiful. It's the only weather you can play with. It enables skiing, snowball fights, igloos, snowmen, sledding, angel shapes on the ground, and whooping. It smells good. It brings out people's kindness and sense of humor. Snow also brought me to Dean & Deluca last Sunday. I'd walked from Dupont Circle to Georgetown and all around the waterfront, and was ready for a break in a heated area with pretty food. I took my time walking through the aisles, inspecting all of the overpriced items and wishing (just for a moment) that I were coming here from my posh townhouse with not a financial care in the world. I had read about Matiz seafood tins and was excited to spot them in the store. Dean & Deluca had two varieties: octopus and sardines. I chose the former, because if I was going to spend $10 on a little tin of fish, I was going to do something slightly unusual. 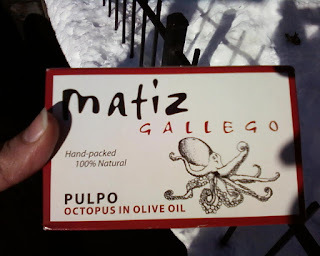 I expected it to be sort of like smooth calamari in olive oil, even though I don't have a lot of experience differentiating between squid and octopus. This was more like tuna than anything else, and definitely fishier than I expected, and a tad slimy. I still think it's worth trying at least once. In my mind, the tin was a splurge, not only because of the price, but because it was being flown across continents and was therefore not environmentally defensible. Buying a pricey tin of Spanish seafood is far from eating local, which I try to do whenever I can. But then I noticed the picture on my bread today. "Why is there a woman jogging on my bread?" I thought. "So weird. It must be from Europe." And sure enough, the provenance was German. Fairly or not, I associate Germans with putting excessive photography of humans on its food products. 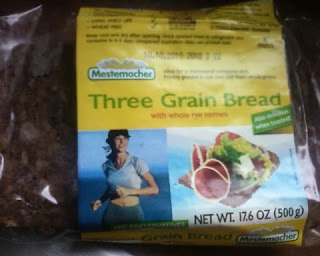 To me, a photo of a woman jogging is not going to sell me on bread. Even if the bread is supposedly healthy, I would rather see a pic of a Buddhist temple or a blue sky with cirrhus clouds -- something suggesting freedom from earthly ties, rather than the penance required in order for me to enjoy a carbohydrate. That said, Mestemacher bread is awesome. It's "healthy," it keeps for a long time, and it goes great with cream cheese and salmon. The German-bread revelation made me realize that I'm probably buying a lot more gas-guzzling food than I'd like to think about. Take, for example, the "Spanish Cocktail Mix" offered at Whole Foods. In general, snack mixes tend to be a crackolicious, salty mix of nuts and starches, and it's not as if America lacks for variety in this area. But only the Euro-peens would think to put frickin fava beans in a mix. This mix will make you forget Hannibal Lecter and see the bean in a whole new way!! Don't be put off by the exorbitant price, or by the label that somehow suggests a terrorist Web site or MySpace page. Just pick it up at the WF now and curse me later. 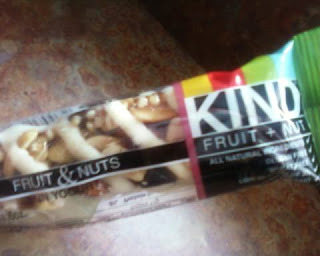 I got on a roll of inspecting other packages in my kitchen -- KIND fruit and nut bars, for example, come from Australia. It's not surprising to me that this brand's packaging is the coolest of the foreign products, because I think Australians are the coolest, for reasons that have nothing to do with actually visiting their country. Other furrrn things popped up in my pantry when I inspected the labels (Green & Black hot chocolate, England; though my Near East couscous, as it turns out, originates in Massachusetts) surprised me. Up until now, I'd focused on produce, but not prepared foods, in terms of buying as local as possible. I can't say I'm going to stop buying all these things tomorrow, but at least I'll feel guiltier about it. Music: "Sardines & Pork & Beans"
Don't feel such guilt. Buying local isn't better. If you're only buying things that naturally grow well in DC, fine. But most "local" food take much more fertilizer and energy to grow, because it's not native to said local area. Drop the guilt and enjoy food. The music link sells this blog post.